In order to comprehend the differences between Slab results and FEM results, slab S1 of example 1 is used. 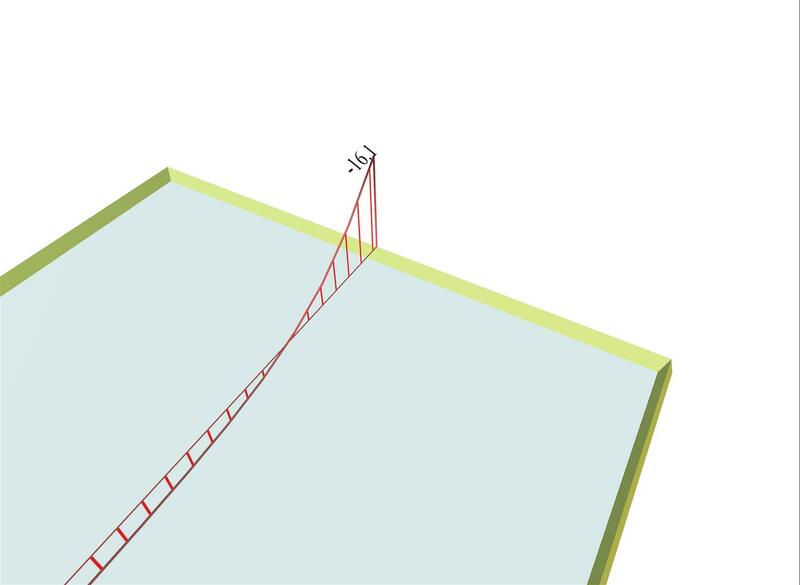 The moment value Ms (Slab Results) in the middle of the common edge of slabs S1-S2 is -16.1 kNm. 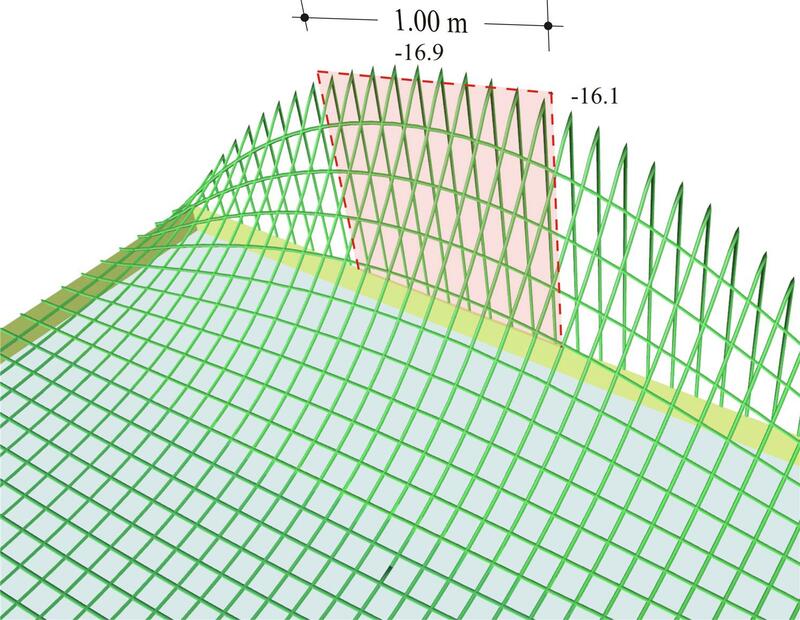 This value is derived by integrating the diagram of FEM results on a rectangle of width 1.0 m, at the middle of the common edge, having peak moment -16.9 kNm. Notice that at the end of the edge under consideration, the bending moment derived from Slab results is not equal to zero, as the one derived from FEM results. This is because the end moment represents the average value the 1.0 m wide area. The slab design is performed using the values from Slab results, which, in general, are considerably smaller at peak points. The integration width 1.0 m can change through software parameters to e.g. 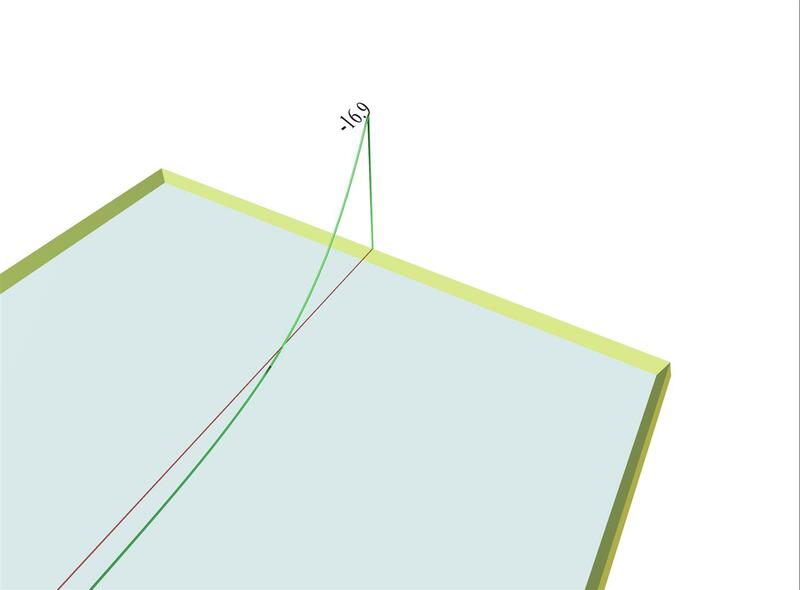 0.5 m.
Figure 4.2.4-5: The support moment is unique for both slabs, however the values on either side differ slightly due to different mesh geometry. 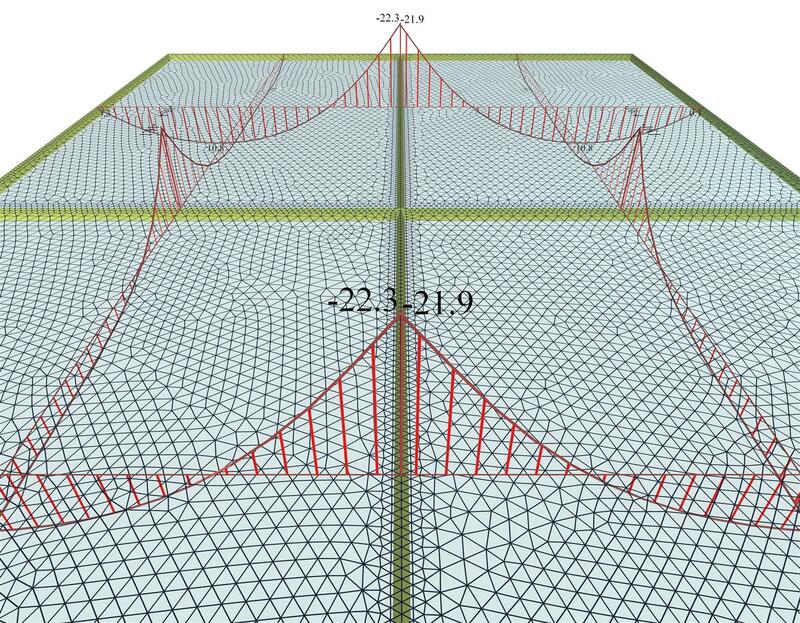 The mesh parameters are identical for all 4 slabs of the project <B_411-1>: "Overall size" = 0.10 m, "Perimeter size" = 0.05 m. However, due to different mesh geometry, there are slight differences between the values of stress resultants in either side of their common edges. The value of the support moment Ms can be considered as either the average value, i.e. Ms=-(22.3+21.9)/2=-22.1 kNm , or the maximum value, i.e. Ms=-22.3 kNm. Figure 4.2.4-6: As much as the number of the finite elements is reduced the accuracy of the results diminishes. 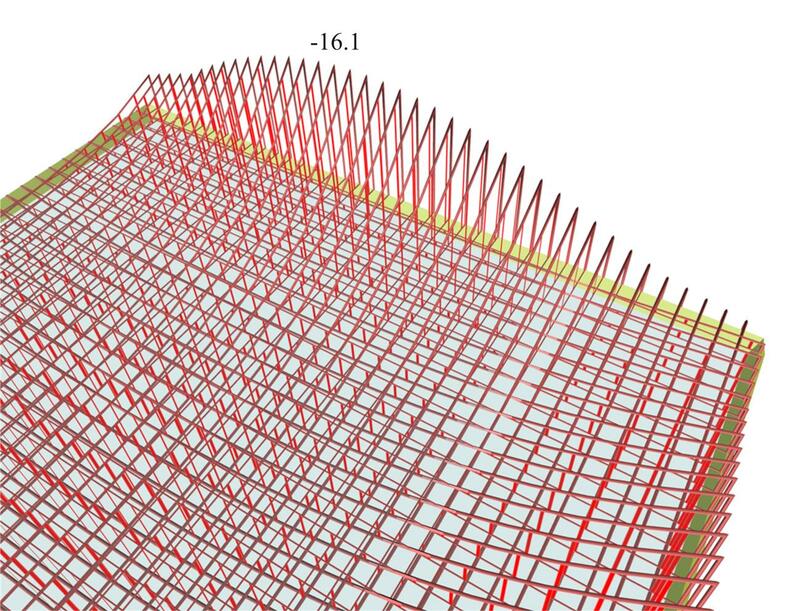 Τhe finite element mesh of the same project <B_411-1> has emerged from the following parameters: "Overall size" = 0.25 m, "Perimeter size" = 0.15 m. The average value of the support moment is Ms=-(21.4+20.5)/2=-21.0 kNm compared to the previous value of -22.1 kNm, which is a significant difference. 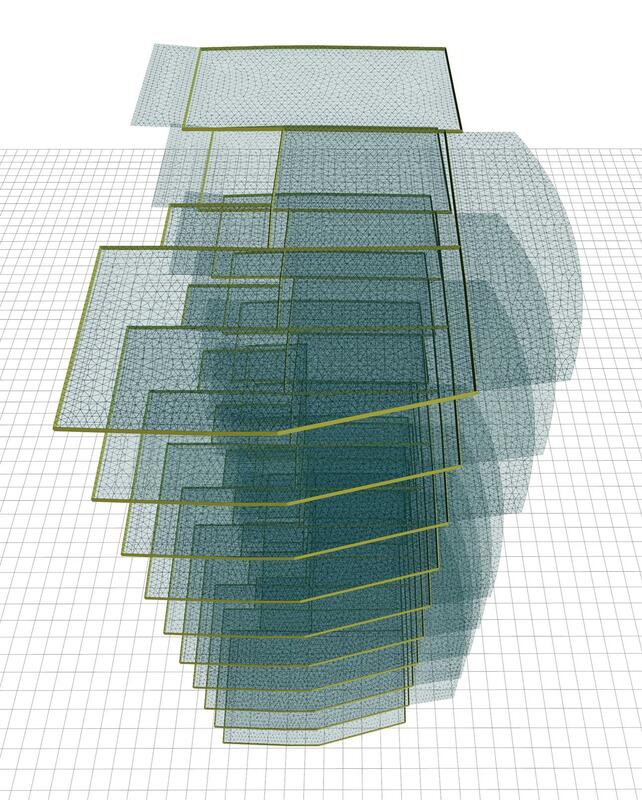 The denser mesh the better accuracy achieved, but at the same time the number of calculations, the amount of memory and time is increased substantially. The computer processor plays an important role, since many algorithms have the ability of parallel processing in their available cores. 29,632 triangular elements, 16,418 nodes, 1201 linear members, system of 98,506 equations, memory 665 MB, time 10 sec, FPS=60 [*] NoteFPS are the Frames Per Second of the 3D display, i.e. is the refresh rate of the screen and it is the size that counts the smoothness of the 4D virtual reality. Τhe human eye perceives the motion as real when FPS>25. As explained in detail in chapter 3 and appendix Α, the influence of beams and columns on the behaviour of a building is very important. 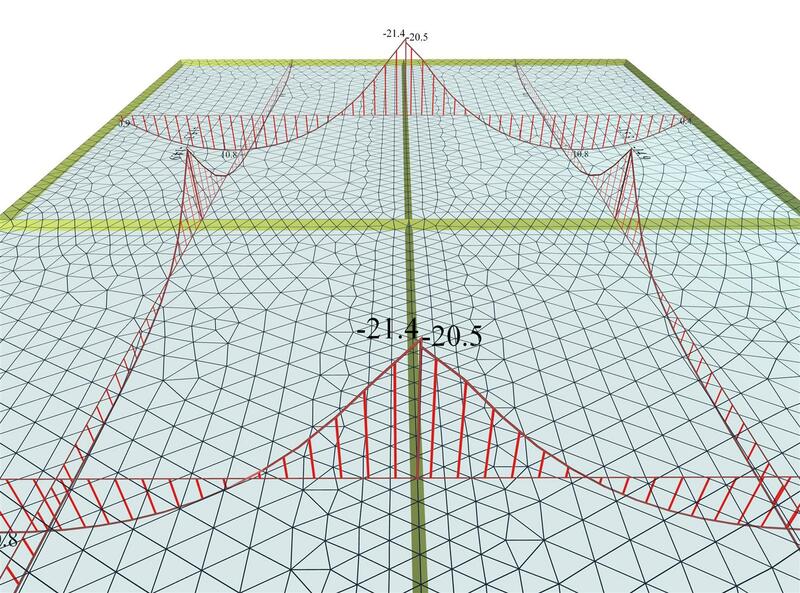 In this example, the bending moment of the slabs S1-S2 is significantly smaller compared to the 'SLABS' module. The support moment, in this module, is provided directly on the side faces of the beams, wherein the detailing takes place. However, the peak moment in the middle of the support (in the middle of the beam) is much higher. For the slab analysis, the unfavourable loadings are created per floor, i.e. loading of any floor slab has no effect on slabs of other floors. In "SLABS" module this effect is obvious while in "BUILDING" module is rather insignificant. 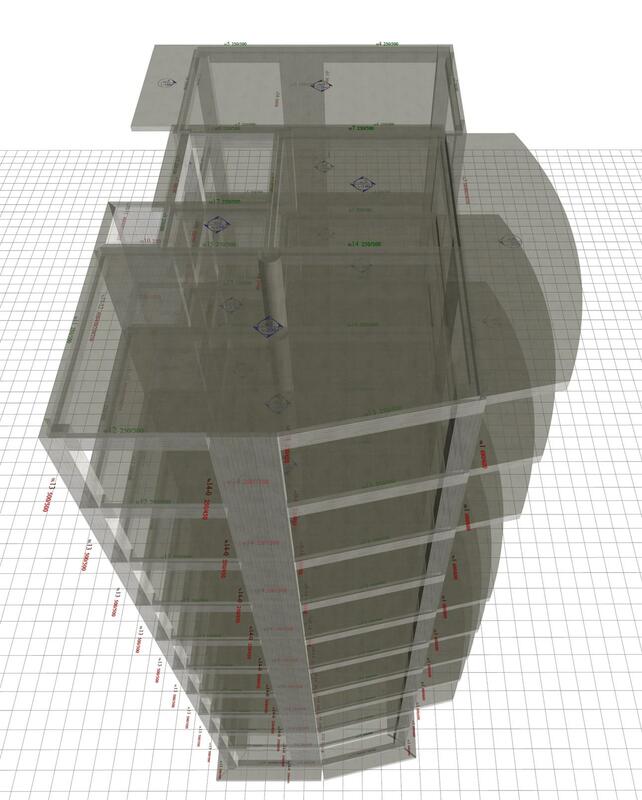 Project <Japan5>, running only in the professional version, consists of 10 floors with an area of 200 m2. 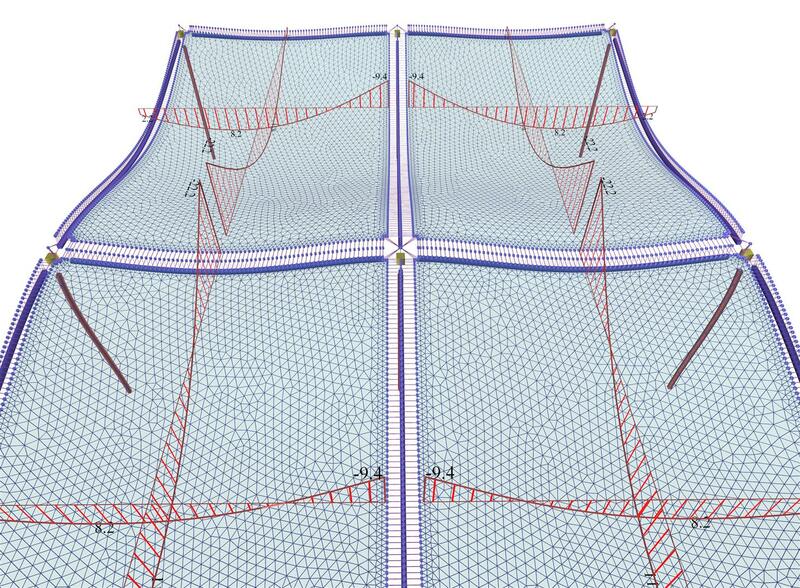 The following measurements are obtained using the following meshing parameters: "Overall size" = 0.20 m, "Perimeter size" = 0.10 m.
Adverse\Slabs - Active module\ "BUILDING"